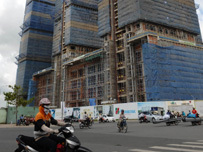 The State Bank of Vietnam has loosened its grip on real estate loans, a long-a waited move that some industry insiders say may help revive the stagnant market. In a decision announced Monday, the central bank excluded some types of real estate loans from the list of "non-production" loans – a credit category that commercial banks have been specifically ordered to control this year. Restrictions have been lifted on loans for home repairs and home purchases, but eligible borrowers are limited to wage earners only. Developers can also apply for bank loans as long as they are building low-income housing projects or other residential projects that can be put into use by January 1, 2012. The central bank earlier this year ordered commercial lenders to limit lending to non-production sectors, with the real estate and stock market identified as two main examples. The goal was to bring credit for non-manufacturing purposes down to 16 percent of total outstanding loans by the end of the year. Following the order, many banks tightened lending to the real estate sector, putting a freeze on the market. Le Hoang Chau, chairman of the Ho Chi Minh City Real Estate Association, said the new decision is what the market needs as it is going through very tough times. Both developers and homebuyers have been struggling with credit access and high interest rates, and they really need to be supported, he said. "The low-price segment and housing for workers should be encouraged," Chau said. "We need to see that real estate contributes a lot to gross domestic product growth in the economy and, more importantly, the sector creates jobs for many people and serves an important link in the consumption chain for construction materials and related services." Bui Tan Tai, deputy general director of Asia Commercial Bank, said despite the new decision to end the credit squeeze, high interest rates will still make it difficult for homebuyers to take out loans. Interest rates on loans for non-manufacturing purposes now range from 20 to 25 percent a year, Tai said, adding that the rates at his bank are between 20.5 and 23 percent.